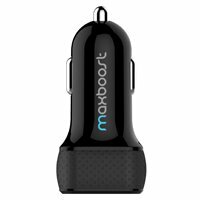 Introducing the Maxboost Car Charger with Smart Port Technology. 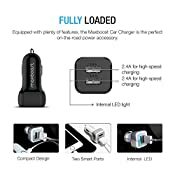 The Maxboost Car Charger with dual Smart Ports are a highly durable, ultra-portable, universal charger for the car. 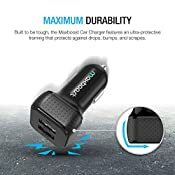 The Maxboost smart port usb car charger is extraordinarily strong, featuring a double injected frame with the solid protection of a polycarbonate inner layer coupled with the flexible external molding of TPU (thermoplastic polyurethane) for a soft grip. 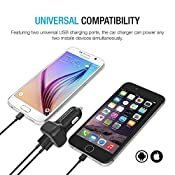 This dual-USB car adapter features a massive 4.8A total output (2.4, 2.4) which is enough power to charge the iPhone or iPad at maximum speed. The 2.4A output also provides fast charging for most mobile devices including most smartphones and tablets. 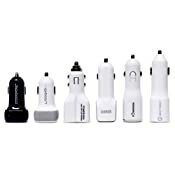 Get ready to say goodbye to carrying multiple adapters & outlets for any type of USB-powered device. 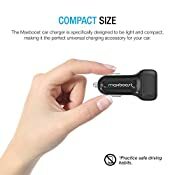 Welcome to 2-in-one power bank car charger convenience era. With 2 ports, you can simply do more and maximize your usage device time.